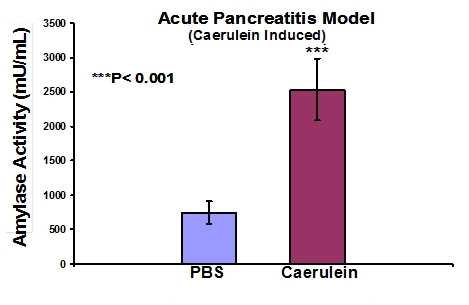 Caerulein-Induced Pancreatitis is a useful mouse model for therapeutic or prophylactic treatments. WBI has validated and optimized this inflammation model for assessment of test compound efficacy. Our model is designed to rapidly assess therapeutic efficacy within a few hours by measurement of serum amylase activity. For compounds showing efficacy in this initial screen additional analysis is available through histopathology and myeloperoxidase (MPO) activity of pancreatic tissue.